One night over spring break this year, I was lying on the hood of a car in Tuba City, Arizona, in the Navajo Nation Native American reservation. Gazing up at the stars above, unobstructed by trees or buildings, I reflected on my week with new friends doing the same by my side. The stillness and peace were broken seconds later as one of our friends proclaimed, “the more you stare, the more you see.” Though referring to the multitude of stars and the breathtaking open terrain around us, I found this to be an underlying theme throughout our entire week of service. Our group of 14 UConn students traveled to the Navajo Nation on an alternative break trip organized by the community outreach office. After pre-trip meetings, icebreakers and education about Native American culture and tradition, we thought were well-versed in the hardships the people face. We learned of ways they are neglected by the government and are treated as less than equal citizens. We analyzed their infrastructure and noticed how the lack of one component weakened the system as a whole. We learned about their struggle to assimilate into American society while holding onto their unique traditions and language. The education was useful in preparing us with a background on the culture, but it couldn’t measure up to what we learned while there— both about Navajo culture and ourselves. We stayed in hogans, a traditional structure with a door that faces east to greet the rising sun. We feasted (quite regularly) on Navajo Tacos, a Navajo staple that consists of fried bread topped with an assortment of meat, lettuce, cheese, and peppers. We prayed in a sweat lodge (which was upwards of 150 degrees inside), jumped from dunes hand-in-hand, hiked the Grand Canyon, and bought turquoise jewelry at the Navajo market. The cultural activities we were fortunate enough to experience helped me feel like a part of their community, but the majority of my learning and growth came from a 5th-grade teacher and her class at the Tuba City Boarding School. Each day we tutored students in the impressive boarding school equipped with smart boards, colorful posters, computers, and playgrounds. At first glance, it didn’t seem in dire need of help. The more I looked at the situation and spent time talking with the students and tutoring them, the more aware I was of the problems they faced. Many lacked educational encouragement in the home, suffered from poverty, had parents with alcoholism, and lived in single-parent homes with more people than beds to sleep on. I realized that it often takes a careful evaluation of a situation to find the truth in it and that the conventional technology couldn’t replace supportive parents at home who promote learning. It took reflecting each night and group discussions to pinpoint in precisely what way this school needed our help. Husky dog, you are a Husky, and I watch the basketball team all the time,” he exclaimed when I told him I go to UConn. “Maybe someday, I’ll even be a Husky.” The students, despite the obstacles they face, are passionate about learning and have dreams of going to college. The better I got to know them, the more I saw that what they most needed was reinforcement that they could succeed and one day attend college too if they work for it. In addition to the cultural learning and serving we took part in, the quote parallels the way in which we learned about each other. We left Storrs a random bunch, only knowing the surface layer of each person— different majors, religious values, ages, political views, personalities. The more time we spent reflecting on our days of tutoring and telling stories about our families and our lives, the more we saw what we had in common and the closer we became. We returned a close-knit group of friends, connected by an incredible experience. Sometimes it takes more than a quick look to understand a situation, a culture or a person truly. Sometimes, as our friend noted, the more you stare, the more you see. It took careful evaluation and patience to realize the issues at the boarding school and determine the most effective ways we could offer our help the students and teachers. It took open-mindedness to learn about the culture and what the Navajo people have undergone because of being neglected by the U.S. government. It took time to get to know each UConn peer and form deeper relationships. All of this effort, we realized, in learning, serving, growing, and bonding was worthwhile in the end. It made for a unique experience, and we continue to reflect on how it changed us. The more I look, the more I realize how grateful I am that UConn and the office of Community Outreach provided our group with the opportunity to learn and serve together. Monica Mula, a Journalism and Economics major from the University of Connecticut, spent her spring break with Amizade in Tuba City, Arizona along with 14 other UConn students as part of an alternative spring break service program to the Navajo Nation. 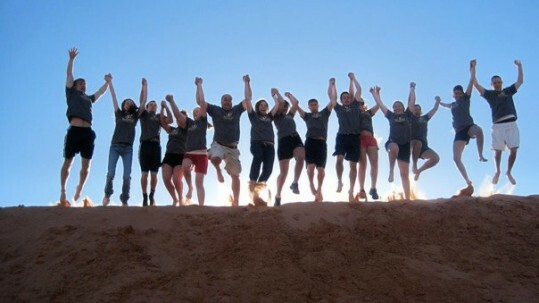 To learn more about the opportunity to serve and learn in the Navajo Nation, click here!